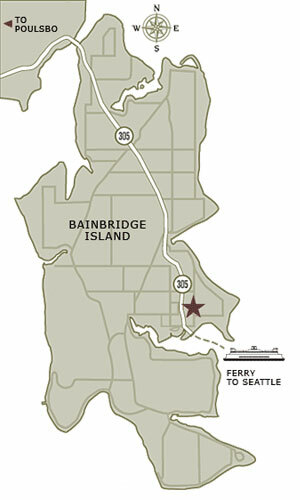 The easiest way to Bainbridge Island is a gorgeous Washington State ferry ride from Seattle Pier 52 Terminal. You can then walk-off the ferry, head up the hill onto Winslow Way, walk west to Cave Ave, follow path, over the bridge and turn directly right after bridge onto the Vineyard Lane property. Look for the Inn at Vineyard Lane signs. We also have specific directions we are happy to email you along with GPS coordinates. Parts of the path are via a forest trail and are both unlit and unimproved. From Seattle, take the Bainbridge Island Ferry. Take Hwy 305 North, approximately a quarter mile. Property is located on the right. Take an immediate right after entering the property and park in spot labeled Inn at Vineyard Lane Registration parking only. If you are traveling from Kitsap, Poulsbo area, we are 5.5 miles south of Agate Pass Bridge. Turn left on High School Road, right onto Ferncliff, right on Winslow Way and right again on Highway 305, then follow the same directions as above.